When I got my driver’s license at 16, the B13 (1990-94) Nissan Sentra SE-R was the car I wanted. Most kids at my high school lusted after Honda Civics, Preludes and Acura Integras, I yearned for the Sentra SE-R with its high-revving SR20DE motor and low-key looks. Alas, I never got a Nissan Sentra SE-R and ended up with a more practical Saturn SL2 automatic as my first car. Over the years and course of many cars, I still yearned for a clean and well-maintained B13 Sentra SE-R, B14 (1995-99) 200SX SE-R or B14 Sentra SE. I even considered the Nissan B16 (2007-12) Sentra SE-R while new car shopping in 2008, but the naturally aspirated QR25DE motor didn’t have the same appeal as turbocharged sport compact competitors. Nissan attempted to inject the Sentra with turbocharged excitement last year with the Sentra SR Turbo, but it was a luke-warm attempt that lacked the raw handling prowess of the B13 SE-R. But Nissan had a surprise up its sleeve with a hotter sport compact tuned by it’s Nissan Motorsports team, dubbed the Sentra NISMO. The NISMO trim is always a sign of something special and currently adorned by the GT-R, 370Z sports cars, and more practical Juke crossover. I couldn’t wait to drive the Sentra NISMO after it’s 2016 LA Auto Show debut. But does the Nissan Sentra NISMO have what it takes to challenge the current batch of hot hatches and mild sport compacts? To find out, I spent a week behind the wheel of a 2017 Nissan Sentra NISMO with an MSRP of about $26,000 before destination. It had the $1220 premium package that adds Bose premium audio and navigation. Nissan Sentras were never styling masterpieces and handsome at most. 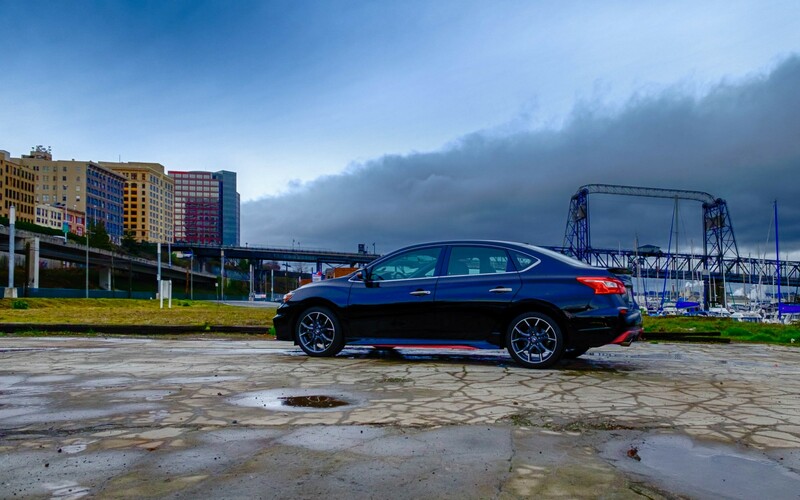 The latest generation Sentra is a snooze to look at in regular guise, but the NISMO ups the visual aggression with sportier front and rear fascias, side skirts, black trimmed headlights and 18-inch wheels. NISMO’s makeover gives the Sentra some extra visual flair without going overboard into the look-at-me boyracer stylings that filled the pages of Sport Compact Car of yesteryear. It’d be easy for a non-car enthusiast to mistake the NISMO for a regular Sentra, and that’s OK. I like the Sentra NISMO’s styling for its subtleness, which lets you keep a low profile unless you’re among other car enthusiasts. Step inside and the Sentra NISMO reveals one of the more notable upgrades from the SR Turbo – the fantastic supportive NISMO bucket seats. The seats are covered in black Alcantara with red accents for sportier looks. There’s a lot more side bolster support on the NISMO seats, which perfectly contours to my 5’7” and 195lb frame. The side bolsters aren’t too stiff like Recarro’s either, but have the right amount of cushion to keep you in place during aggressive driving without making it hard to get in and out of the seat. Heated seats are standard in the Sentra NISMO and can easily toast your buns on a freezing day. Nissan wraps the steering wheel in Alcantara too, which makes it easy to grab a firm grip. A heated steering wheel would have been a nice addition, but the Alcantara wheel wasn’t freezing cold to touch on an icy morning either. 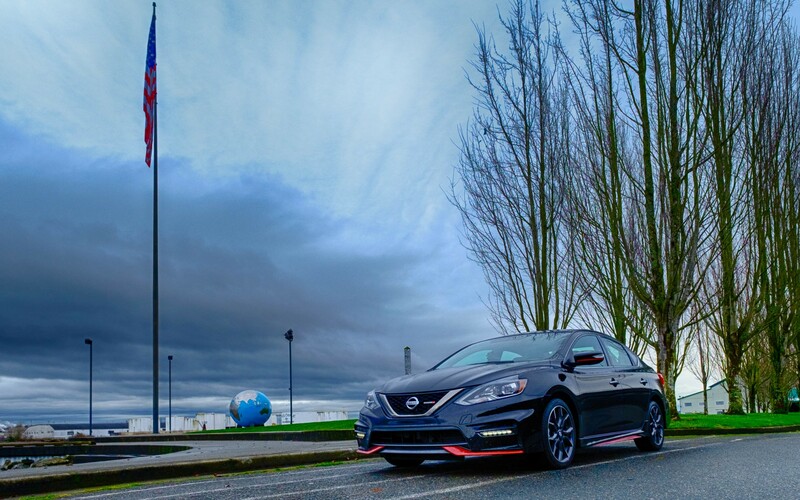 Nissan offers a $1,220 premium package for the Sentra NISMO that adds a Bose premium sound system and a NissanConnect navigation system. The NissanConnect system doesn’t support Apple CarPlay or Android Auto, unfortunately. My experience with the 5.8-inch NissanConnect system wasn’t positive. The screen is too small and the maps are severely outdated. The POIs were a couple years out of date in the state of Washington, so the system attempted to navigate me to the old address for the Hands-on Children’s Museum in Olympia, Wash, which moved to it’s current place in 2012. The user interface is standard Nissan fare, which is a bit dull and flat. Nissan doesn’t employ any transition effects for the UI so it feels like something from the early-aughts than 2017. Bose premium audio is disappointing as it is in every car, yet Nissan continues to stick to it. The sound is dull and lacks mid and low range, but you do get fancier Bose badging on the rear decklid speakers. Fortunately, Nissan still uses a standard double din form factor head unit in the Sentra NISMO, which makes installing an aftermarket head unit easier. You’re better off skipping the premium package and opting for an Apple CarPlay and Android Auto compatible head unit from the likes of Alpine, JBL, Kenwood or Pioneer, replace all the speakers with something from Infinity and pocketing the leftover cash. Powering the Sentra NISMO is the same 1.6-liter turbocharged four cylinder as the SR Turbo trim level. The turbo mill drives the front wheels and puts out 188 hp and 177 lb-ft. Redline is at 6,400 RPM, which is a far cry from the original Sentra SE-R’s 7,500 RPM, but what the NISMO lacks in redline, it makes up with oodles of low-end torque that’s flat from 1,600 RPM and on. A six-speed manual and continuously variable transmission (CVT) are available with the Sentra NISMO. The test vehicle supplied to us had the CVT, which is a no-cost option for the Sentra NISMO. I’m usually not a fan of CVTs, but the Sentra NISMO transmission isn’t terrible thanks to the abundant amount of low-end torque and turbocharger. It’s not as engaging as rowing-your-own gears with a third pedal, but much easier to live with as a daily commuter in bumper-to-bumper traffic. Regardless of transmission, the Sentra NISMO motor fascinates me so we put it on a vehicle dynamometer (dyno) to find out how much power it produces at the wheels. To find out, I stopped by Drift-Office in Auburn, Wash. to discover how much power it’s really making. Drift-Office is a tuning shop that specializes in ECU tuning for cars like the Subaru BRZ, WRX, Scion FR-S, Nissan 350Z/370Z, Infiniti G35/G37 and many others. Since the loaner vehicle we had was equipped with the CVT, it makes testing power on the dyno a bit challenging due to the lack of actual gears. The CVT has a manual mode that lets you select seven different steps on the CVT, but it has a mind of it’s own and automatically upshifts, hence the odd dips in the graph. Nevertheless, the Nissan Sentra NISMO produced 180 hp and 169 lb-ft of torque, which isn’t too far off it’s 188 hp and 177 lb-ft rating. Either the Sentra NISMO has a very efficient transmission, or Nissan under-rates the motor like the Infiniti Q60 3.0t Premium. By the 4th run, the Sentra NISMO suffered some heat soak, which is why it produced less power than the first couple runs. Heat soak isn’t something you have to worry about when driving on the road, because the car is physically moving and directing air to the intercooler. On a dyno, a large fan attempts to mimic that effect, but the fan is up against the wall and doesn’t exactly blow cold air. 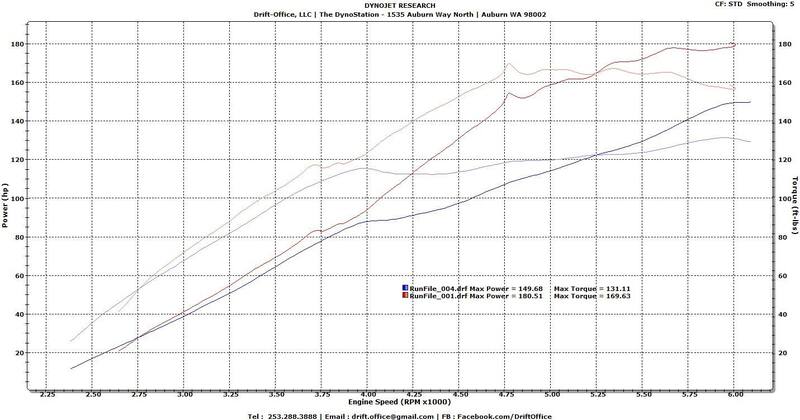 My cohorts at Drift-Office attempted to read the ECU from the Sentra NISMO with Ecutek, a popular ECU tuning solution, but failed to detect the car properly. It’s not all bad news, however. The Sentra NISMO ECU is the same one used by the similarly-powered Juke Nismo, so once Ecutek can detect 2017 model year vehicles properly, it shouldn’t be hard to tune the Sentra NISMO’s 1.6-liter turbocharged motor for more power. A lot of NISMOs focus is on the suspension and the Sentra NISMO receives stiffer springs and monotube rear dampers. The standard Sentra’s rear torsion beam suspension remains, unlike the independent rear suspension of the Hyundai Elantra Sport, which is the Sentra NISMO’s direct competitor. NISMO tunes the electronic power steering (EPS) for better precision and feel. A set of Michelin Pilot Sport 215-width all-season tires wrap 10-spoke 18-inch wheels to complete the package. All the NISMO suspension upgrades result in a 0.4-inch lower ride height and an enjoyable sport compact to drive. I found steering in sport mode precise with plenty of road feel, albeit a little on the heavy side. Simply point the car in the direction you want to go and it follows – at least while staying within legal speed limits. The Sentra NISMO suspension is painfully stiff but the shocks lessens the pain somewhat. The ride is harsher than the regular economy Sentra, but I didn’t have any major aches and pains after many hours of driving, thanks to the comfortable seats. At 3,037 lbs (6MT), the Sentra NISMO weighs 25-percent more than the Sentra SE-R I yearned for in my younger days, but power increased by 34-percent. Power-to-weight ratio is slightly increased with the new Sentra NISMO, at the sacrifice of the SE-R’s velvety-high 7,500 RPM redline and independent rear suspension. It’s hard to get excited about the Sentra NISMO when cars like the Ford Focus ST and Volkswagen GTI can be had for a little more money with over 200 hp. Even Hyundai offers the Elantra Sport with 201 hp and better technology for less money. Yet the Nissan Sentra NISMO appeals to me emotionally and that speaks louder than numbers. The Sentra NISMO is a basic automobile too. It doesn’t have automatic emergency braking (AEB), adaptive cruise control or lane keep assist systems so there aren’t annoying beeps and computers attempting to aid your driving. The interior is a simple throwback to the days when radios were DIN-sized and climate control was manual. Hell, if you came from a B13 Sentra SE-R to the latest NISMO, you’d feel right at home. But unlike the original SE-R, the Sentra NISMO will fair much better in a car accident thanks to modern safety technology, like crumple zones, side impact beams and air bags. The 2017 Sentra NISMO is far from perfect and there are better choices out there, but it’s a reminder that Nissan can produce something great that doesn’t bare the GT-R or Z badge, even when it’s given the forgetable Sentra as a starting point. Ultimately, I enjoyed my time with the 2017 Nissan Sentra NISMO and it’s the mild-sport compact that I’d buy. I could never picture myself owning a Focus ST or GTI, but the Sentra NISMO is more my style. After driving so many cars loaded with the latest driver assist technologies and extremely integrated infotainment systems, the Sentra NISMO is a refreshing back-to-basics car.